Rotate your rug on a regular basis. This is especially important if your rug is in a high traffic area (an area where a lot of people constantly walk by) where your rug will receive a lot of wear and tear. This will enable your rug to wear evenly i.e. one corner of the rug won’t look more worn than the others. Prevent people from walking on your rug with dirty shoes. You can do this by either creating a no shoes policy in your home or by having entry mats which will create a barrier and remove dirt from shoes by the entrance points to your home. 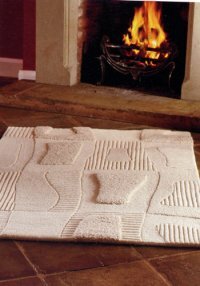 Ensure that you never place your rug on damp or wet floors, this will just encourage breakdown of the fibres from which they are made from and could make your rug start to go mouldy. Cleaning your rug is especially important for increasing the life of it. Wool rugs tend to shed a lot and vacuuming them regularly will eventually prevent this from happening. If you are unfortunate to spill something on your rug which face it is quite likely as in a busy home accidents can quite often happen, first thing’s first, never ever rub your rug. This will only spread the spillage further and push it deeper into the fibre. The best way to tackle a stain is to get a dry absorbent cloth, paper towelling or alternative and blot the surface of the rug to soak up the spillage. Try to prevent the spillage from getting any bigger by removing excess with a plastic spatula, blunt knife or other suitable utensil. Brush the pile so that the stained area is flowing in the same direction of the rest of the pile and use a stain cleaner solution. It is highly recommend that you spot test the cleaning solution on a small area of the rug before applying it in large quantities. Some cleaners can damage the pile of the rug or bleach the fibres so it is best to use a cleaning solution that you know is safe. Rug Doctor has some excellent stain removing cleaners that are suitable for cleaning rugs. As with all stains it is advised that if you are not confident in tackling it that you seek advice of a professional rug cleaner, they are often cheaper than you would think and can remove some of the most stubborn stains with ease. The key to maintaining a healthy rug is to vacuum it regularly. Different types of rugs respond better to different methods of cleaning. Below lists the type of rug and the best type of vacuum cleaning method. Shaggy Rugs - Shake shaggy rugs to release all the dirt and grit that may be lodged within the deep pile and then use tools on the lowest setting to prevent the shedding that occurs with these rugs especially the wool variety. Hand Tufted and Hand Knotted Rugs - You should only ever use suction only vacuum and beater bars should not be used on the surface. Upright vacuums with beater bars on them should be used on the highest settings so that they are just skimming the surface of the rug pile. Machine Made Rugs - This includes rugs with a cut pile and they should be vacuumed with a vacuum with beater bars on the lowest setting thus keeping the pile a good length and loosening grit from within the base of the pile. These types of rugs should also periodically be turned upside down and the back of them vacuumed to break the loose grit and dirt away from the base of the pile. Other Rugs Including Natural and Sisal - These types of rugs should be vacuumed normally with a suction only type vacuum and the beater bar should be set to the surface of the rug. Using an anti slip rug underlay is recommended. This will prevent dyes from the rug seeping through to the surface below and will also prevent your rug from slipping which will prevent it from ‘walking’ around your room. Think about it, if your rug is constantly moving from the place you have put it, it will wear more. Anti slip rug underlay will prevent this. There are many products on the market that claim to prevent rugs from walking, including sprays and underlay. 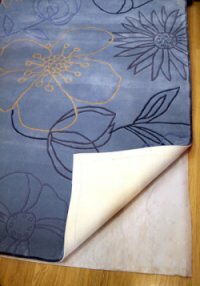 A good underlay hugs your rug to the surface that it is placed on by creating a friction between the surfaces, thus protecting the surface your rug is on and your rug at the same time. What to bear in mind when choosing and buying a rug.